No katana collection is complete without this unique work of art. 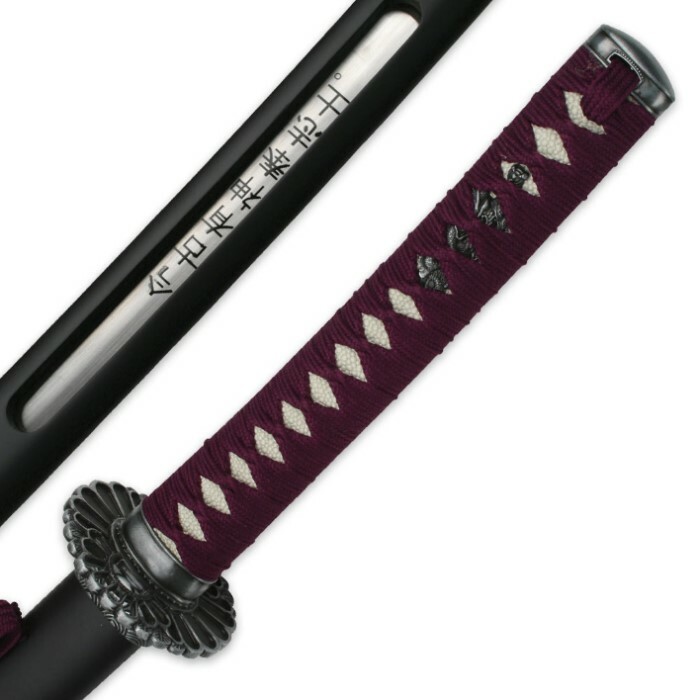 The specially designed saya has a window on both sides to display the symbols on the blade. In the process of creating the ideal custom katana, we did not stop there. 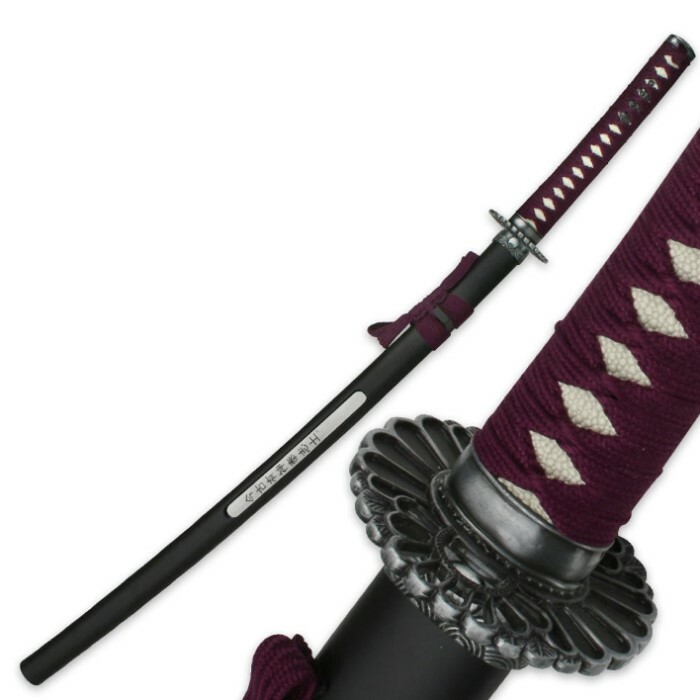 You will find the sword's detailed guard, collar, and ornament to be equally eye catching. When you grasp the braided handle and unsheathe the blade, you will find even more visual aesthetics in the detail of the tempered line and edge. 39.5 in. overall, 27 in. blade. Hardwood saya (scabbard) with window. Hardwood handle with nylon wrap. The symbols read "Since ancient times to the present, God is with those who serve with dignity and honor". I am happy with my purchase. For the price it is a very good value. For the cost, I would recommend this purchase. It's not "museum quality", but well worth the price. 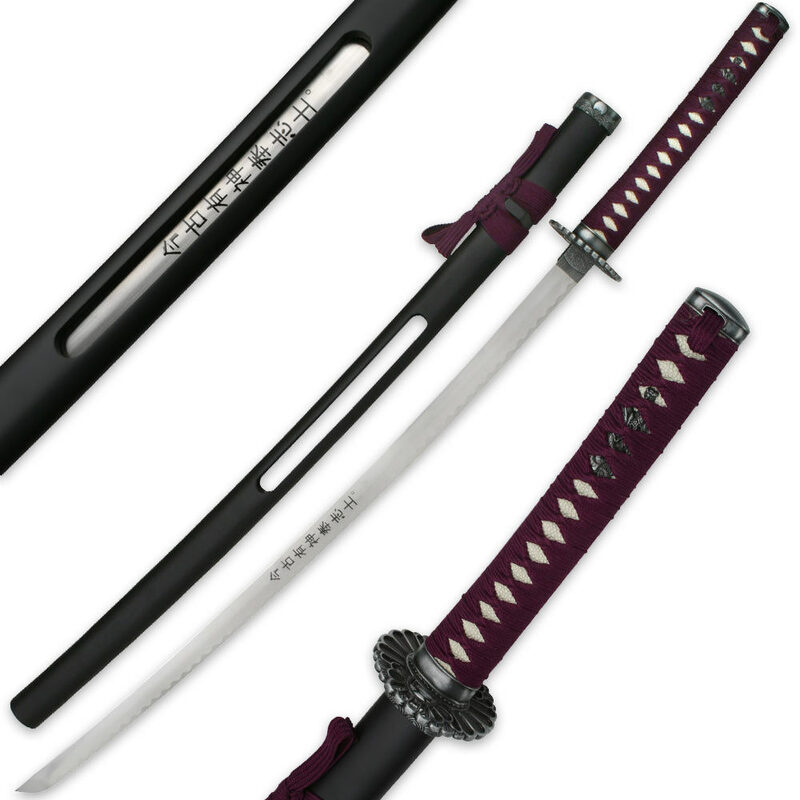 This is my first katana looks nice and blade will bend if shaken but is strong but it is also a great display. Once I got this beauty in I had to go ahead and ordered another . Great piece .Don't wait. This sword is BEAUTIFUL!! The cord on the handle is almost purple and well wrapped. I love the tsuba as well. The blade on this sword is a thing of beauty. Mine came sharp enough to cut through water bottles and milk jugs. But it's so pretty I don't wanna do that and risk scratching it. If you're thinking about getting this sword, stop thinking, just get it. Thanks BudK!! Though it is made to be put on a wall or display case, the stainless steel holds together very well. It's also very attractive and makes for a good first sword. The blade is about as sharp as a $5.00 machete, but stainless steel doesn't require too much maintenance or extra care, so sharpening is easy. Excellent buy for $20.00. I got the sword a day early and was very please with the quality and colors. The handle WAS wrapped with a deep purple color, contrary to what the description states. The color is slightly lighter than what is pictured, but still looks very cool. Scabbard is made of fragile wood, but grips nicely and looks decent. Very good for the price. This is a great sword. Playing fruit ninja works until you hit on of the items at and angle to were it deflects the sword and bends it. But if the sword bends you can easily bend it back. Like other review the scabbard holds the sword tightly. Excellent for the price. Blade is sharp and fittings are indeed metal. Of course there are some little things like the habaki isn't tight around the blade but it does make an amazing display. And it is well made enough that you could easily show it off.